Defining your dream is a great start. And removing obstacles is a game changer. But just like putting a destination in your GPS, and getting in your car is not enough, you can’t really get anywhere till you start driving. Once you have decided where you are going, and you have done the hard work of defining and owning your obstacles, it’s time to start moving toward your goal. Forward movement requires a few items. Move forward on that path. Sounds simple but it can truly be difficult at times. It’s easy to lose heart if you thought the pathway you were on would surely get you there and some obstacle gets in your way. That’s why #3 is so important. Heb. 11:39 talks about those who died without receiving the promises they had hoped for and yet these folks are listed as a part of the great cloud of witnesses. There’s an unusual pathway near our home where you can see a quarry lake (that’s when a former quarry fills up with water) on one side of road about a 100 feet down. On the other side of the road is a steep drop about 300 feet to a river that is disconnected to the lake. Freudian slip perhaps. But I believe God had something in that phrase for us. Sometimes we think things are something they really aren’t. What if the obstacle that has been holding you back is just an optical illusion? What if there is a path around the hurdle you feel you can’t get over? All good stories have one thing in common. All of them. Think about it. Got any ideas? Here’s a hint. Have you ever stopped watching a series? The number one reason people stop watching a series, or skip ahead in a book, is because they are bored. Here it is: one thing all good stories have in common is a plot! The plot gives us a reason to keep watching. We are wondering what’s going to happen? 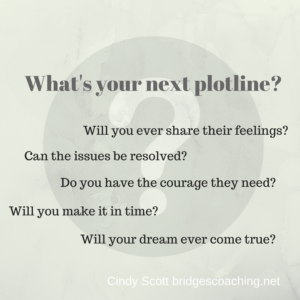 If you are bored with your life, it’s likely your plot line is lagging. Have you given up hope? Are you not sure what’s next? Having a destination clarifies the journey! If you don’t know where you are going, how will you know what your next step is? If you don’t have a purpose, your adventure is on pause. 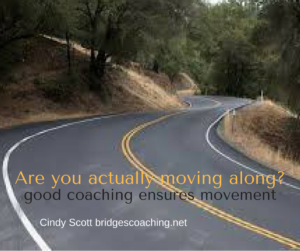 If you can’t move forward for some reason, removing that reason can be your next target. If you don’t have a dream, whose dream could your skills make happen? How To Take Your Leadership To The Next Level! 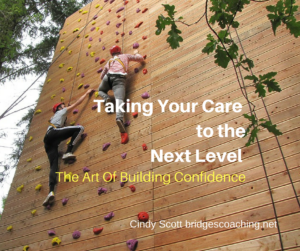 What if taking your care to the next level required less of you but was more effective?! Caring for the young requires a lot from the caregiver. They need things done for them. They have to be taught about expectations. They need to practice to get things right. It can be downright exhausting, but now that my kids are grown I am so proud of them. They feed themselves, tie their own shoes, read on their own etc. In fact my kids have mastered adulting and are having their own families and making an impact on the world! I’m so proud of them. When they were young it wasn’t always easy, but as we taught them how to do things they grew and became more and more healthfully independent. Our church family is like this, too. When people are young in faith they need to have things done for them, be taught about expectations and they need practice to get things right. Indulge me a little musing in this blog? 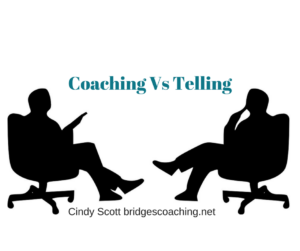 I was chatting with a couple coach trainees recently and we got to talking about how much easier it is to just tell people what to do… But true coaches DON’T tell people what to do. True coaches use active listening and powerful questions to help people engage with God toward the desires God has put in their hearts and the the way God is leading them! True coaching requires patience, trust and belief. These things take time and don’t come easy. Let me explain. 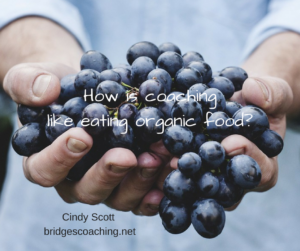 Coaching walks with a person while they are learning to hear God’s voice for themselves. It would be much easier for me to just tell them what to do! 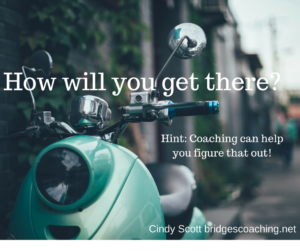 In Part 1 of this series we saw that without choosing a focus the coaching conversation (and our lives) are just rambling around with no destination. Once we know where we are going we need to have a way to get there. It seems elementary, but just like no one sets out intentionally to not focus, few people choose a focus and then choose not to make a plan. We all do it though. We want something that we aren’t really doing anything about. Which of these are on your list? to stay connected with family. to make our living environments aesthetically inviting. not to be too busy for the important things in life. The list could go on and on, but it doesn’t need to. Coaching isn’t for the weak. Moving forward isn’t usually easy. 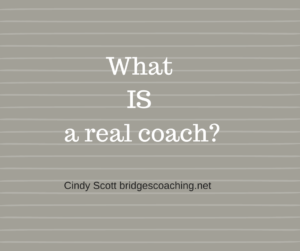 It takes clarity, confidence and courage to advance, for both the coach and the coachee. Let’s break it down. 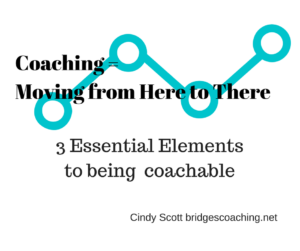 If Coaching = moving from here to there, then a vital element in the coaching conversation starts with the “there”. If someone isn’t sure where they are heading, they are just roaming. Roaming means wandering around, or not having a destination. 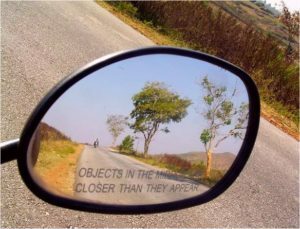 There are two common detriments that distract people from having a focus. 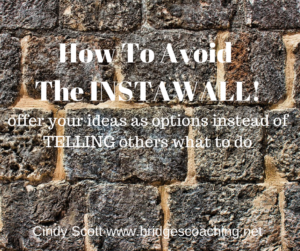 How To Avoid The "Instawall!" You already know what the Instawall is! You’ve likely been on one side or the other multiple times, but now you have a word for it. It happens when someone says something that builds an instant wall between two people where no matter what was said it cannot be considered a valid choice. A line of respect has been breached and the listener feels small, invalidated or infantized. Each of these lines assumes the speaker knows best what should happen next for another person.